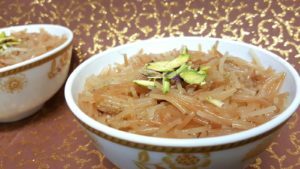 Vermicelli cooked in sugar syrup to make a dessert absolutely delicious. Meethi semiya is more about patience than ingredients and instructions. 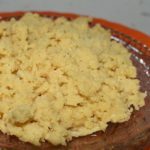 You need to let the semiya sit so that the sugar syrup gets absorbed. 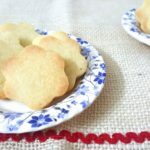 It is a simple and easy dessert which calls for very few ingredients. Variety of vermicelli are available these days made up of wheat, all purpose flour, semolina etc. I choose the one made up of semolina or durum wheat. You can pick any of your choice. Even roasted vermicelli is available and these days I am using that one. 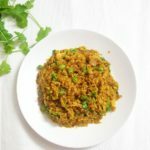 However when I prepared Meethi Semiya Recipe for the blog I had the unroasted ones so I roasted them and then proceeded with the recipe. For flavouring I have added cardamom powder. 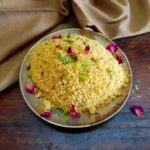 You can also add desiccated coconut/dry fruits/rose petals etc. 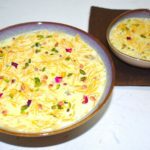 Other vermicelli/seviyan desserts on the blog are sheer khurma, seviyan ki kheer. 1. Roast 1 cup vermicelli in 2 tbsp ghee till they are golden brown. 2. Add 2 cups water to it. 3. Let it cook on low flame with the lid on till the water is completely absorbed by the vermicelli and they become soft. 6. Cover and cook for till the sugar syrup is almost absorbed. 4. Add 1 cup sugar. 5. Cook till the sugar gets dissolved. 7. After 2 minutes there will be some un-absorbed sugar syrup. 8. Switch off the flame and cover the meethi semiya and place some weight on it. Let it sit so for 10 minutes or till the syrup is completely absorbed. 9. After 10 minutes the syrup would have been absorbed. Dear Vini, please help me with the measurements how much 1 cup is equal to ans is 1cup same across all your recipe.